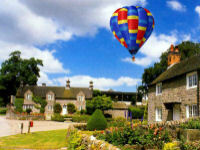 Website and processes: 24 May 16 Alan, 4/5 Good "looking forward to the experience"
An exclusive for 2 champagne hot air balloon flight from Tissington Hall valid for weekday mornings only. A once in a lifetime experience accompanied by champagne that you can't afford to miss out on. This is exclusivity at its best, just you and one other thousands of feet above the English countryside enjoying the breathtaking views together. Of course, close to the village lies the famous Tissington Trail, a disused railway line now transformed into a wonderful walk and cyclepath linking Ashbourne and Buxton. So for the energetic amongst you we can heartily recommend a brisk stroll either before or after your flight!